As we age in place it’s important to keep the mind challenged and engaged. Thankfully, in this technological age, there are a number of electronic devices that aide in that quest. 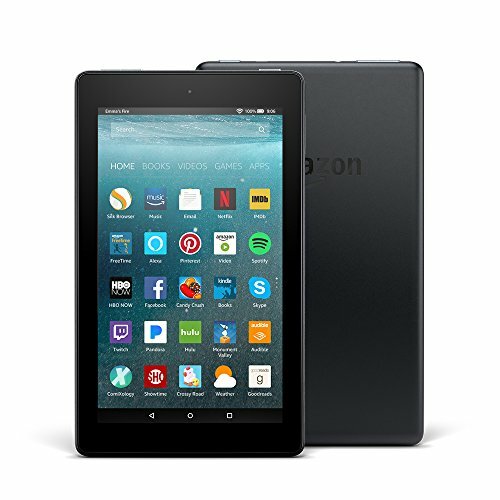 The Amazon Fire 7 Tablet is such a device, appropriate for a variety of tasks, such as playing games, taking photos, browsing the internet, and reading books. This tablet is ideal for seniors who want to be engaged online, but don’t want to sit in front of the computer for a long period of time. The Amazon Fire 7 Tablet has some drawbacks, but the positive elements make it a worthy contender. The operating system is easy to learn—even for the most technology disinclined—the tablet performs well, and the battery is long-lasting. Whether it be keeping up with email, reading the news, playing a game, or doing a puzzle, computers offer a lot to keep our minds challenged and occupied. But for some seniors, sitting in front of a computer for too long leads to discomfort—and in some cases, can cause serious pain. With the introduction of hand held tablets seniors can now opt to sit in a comfy chair or rest in bed, and still stay connected. The Amazon Fire 7 Tablet offers all of the functions of a traditional tablet in a compact, and easy-to-carry device. Even better, you can access all of Amazon’s digital services for entertainment—including TV shows, movies, and music (with an Amazon Prime membership)—as well as snap photos or get some work done with this tablet. The tablet comes with a slot to add additional memory to ensure that you have enough and can add more space to host your media (games, pictures, music, etc.). The Amazon Fire 7 boasts an operating system that is easy to learn and navigate—even for seniors new to the tablet market—and the physical design makes the tablet easy to handle. The overall design and display are very similar to the model before this one. They are both easy to adapt to. The physical design features a plastic body that is matte. However, when you press on the back of this device, there is some flexibility. You can choose from blue, yellow, black, or red, depending on your color preferences. The casing around the screen is fairly sustainable, making it comfortable to hold without fear of randomly launching programs or touching the wrong key. The Amazon Fire 7 is lightweight, weighing about 10.4 ounces and measures 7.6 by 4.5 by 0.4 inches. This tablet is thin and relatively small, making it easy to carry around, slipping it into a purse or a carry bag. You can opt to put a cover on this device to provide additional protection, but do know up front that a cover does not come with it. It’s simple to access the physical controls even when you are not looking, as they are located conveniently near the corners of the tablet. On the right-hand edge of the tablet sits the MicroSD slot, which is a 171 ppi pixel density screen with a resolution of 1024 by 600. The Amazon Fire 7 display is seven inches, making it ideal for everything from compiling emails, testing out a new brain teaser game, to sitting back and watching a movie. You can adjust the brightness, but you will have to do so manually. This tablet does not contain an ambient light sensor. On bright days outdoors, it is difficult to see what is on the screen. At night, you can use the Blue Shade mode. This helps to reduce sleep disruptions associated with blue light. When you are using this mode, the screen takes on an orange hue. This is helpful for seniors who choose to operate the tablet in bed and have a partner sleeping next to them. The Amazon Fire 7 Tablet uses the Amazon Fire operating system. You can make some tweaks to ensure the device works well with Android, and it is compatible, but for the most part, you can work within the Amazon restrictions without issue. The content in your Amazon library syncs automatically to your tablet. You then have the option to either download or stream the content. The operating system has a document reader, mapping and email apps. When you go to download any of these, the system sends you to the Amazon Appstore. The Appstore has a wealth of Android apps to choose from, but not the availability that you might be used to from the Google Play store. You can load other Android apps by using APK files that you can transfer from a MicroSD card or PC. One thing that might be frustrating is when you are looking at your lock screen, you will see various Amazon products on the screen by default. However, for a $15 fee you can avoid seeing these ads on this screen. In addition to the basics, there are some nifty features you might want to take advantage of. The parental controls and kids’ content are notable if you have grandchildren who will use the tablet frequently. There is a FreeTime Unlimited which includes a variety of age-appropriate videos and books for kids to enjoy. As part of this subscription, there is also a web dashboard. You can use this to control and monitor your grandchild’s usage on the tablet, up to four child accounts. The Amazon Fire 7 Tablet supports Alexa. To perform a voice search, hold down the home button. What this means is after checking email, catching up on the news, and playing a round or two of brain challenging games, you can sit back and have Alexa read an audiobook to you. Keep in mind though, when you use the hands-free Alexa, it is important to note that this may reduce the overall battery life. This networking and chipset information gives you some insight into the overall performance of this tablet. To ensure that it meets your needs, it is crucial to explore this information. The operating system is Android 5.1-based, and is the Fire OS 5.4. The processor is a 1.3 GHz MediaTek processor. The RAM is one gigabyte. Overall, these specifications are very basic and what you would expect in a low-end tablet. The internet is a type of dual-band Wi-Fi. The network transfer speeds are quite fast as long as your router has 5 GHz and 2.5 GHz support. With this type of internet, you can stream media and transfer content from your home computer or Network Attached Storage (NAS) without issue. Despite the specifications, the overall responsiveness of the operating system is relatively quick to react. Users might experience some hiccups and slowdowns on occasion. There might be a short pause of approximately two seconds when you click on the Library button and it might take about three seconds to respond after hitting a magazine. When you are waiting for your device to respond, there is just a black screen. You can use this tablet to play some games, but those with intense graphics are typically not ideal. However, common mobile device games, such as Candy Crush, tend to run well. You can choose between an eight gigabyte or a 16-gigabyte model. You do have the option to expand the storage up to 256 gigabytes. This space can accommodate a wealth of digital content. To conserve space on your tablet, you can keep your Amazon content on the cloud storage; there is unlimited space with the cloud. The Amazon Fire 7 features a built-in microphone and a mono speaker. Those, coupled with the camera, allow for handy Skype sessions—even on the go. Since you can expand the storage, you can create a rather vast music and video library on your tablet. You can also choose to store some video and music content on the MicroSD card so that it is removable. While the resolution in this tablet is relatively low, the movies look clear. You can see the different colors well, and there are minimal visual disruptions. When there is a lot of white on the screen, you might notice a minor blue tint, but not so much that it’s distracting. Since the speaker is so small, you should use headphones when you are watching television or movies. This option enhances the audio experience. It also ensures that the sound is clearer and not muddy. With the storage expansion options, it is relatively easy to put together a large music library. Just like with movies, when you are listening, it is best to do this with headphones. This provides a crisper sound. The battery life on the Amazon Fire 7 Tablet is approximately four to five hours when using maximum brightness and constantly streaming videos from the web. When you vary your activities, you can expect up to about eight hours of battery life with a full charge. Charing is easy with the USB cable, simply plug the device into a laptop or desktop computer to charge. To enhance the battery life, turn off the device when you are not using it. You can also reduce the brightness to get more use out of every charge. When your battery is almost empty, you can expect about six hours to achieve a full charge. Overall, the battery life is quite good and even better with a few minor tweaks. This ability makes this tablet an ideal one to travel with since you will not have to stop frequently to charge the battery. The camera on this device includes both a rear-facing and front-facing option. The front camera is a VGA. The rear camera is two megapixels. It also allows you to take video at 720p HD. Overall, the camera is not exceptional, especially compared to the cameras you find on today’s smartphones. It is ideal for quick photos that do not need to have intense detail and clarity. The rear sensor on this camera crops the sensor output. It takes it from a 4:3 to an aspect ratio of 16:9. The resolution is 1600 by 1200. Overall, the images come out relatively soft. The front camera is low-resolution. It may be ideal for a quick selfie, but the photo can lack detail. If you are planning to use this camera for video messaging, you will need good lighting for the person you are chatting with to see you well. The Amazon Fire 7 Tablet provides for the price and is ideal for seniors new to the tablet market. The media player is capable, and the overall design is durable. While some of the hardware could benefit from expansion, it doesn’t stop you from taking advantage of the features this tablet offers. Its slim, compact design is ideal for seniors traveling to the doctors office or flying across the country for family holidays. Books, games, music, entertainment…it can all be stored on this one device and be available at the touch of a finger. The key, as with any tablet, is the battery and keeping it charged when needed. On a full charge, the battery lasts up to eight hours. This length of time is respectable for this type of device. You also have access to Alexa, simplifying the usage of this tablet. Overall, the Fire serves its purpose. Its functionality and ease of use make it a good choice for people of all ages, including seniors who are learning to use this type of device for the first time.